Once upon a long time ago I thought about writing a review of Doodle, an online scheduling tool for simplifying the process of creating meets in which all participants can actually participate. Google relevant terms like “Doodle competitor,” “Doodle alternative,” “online scheduling tool,” “online meeting app,” and so on. Go to AlternativeTo and see what alternatives they had to Doodle. Visit a bunch of these options and review them in a hasty manner. 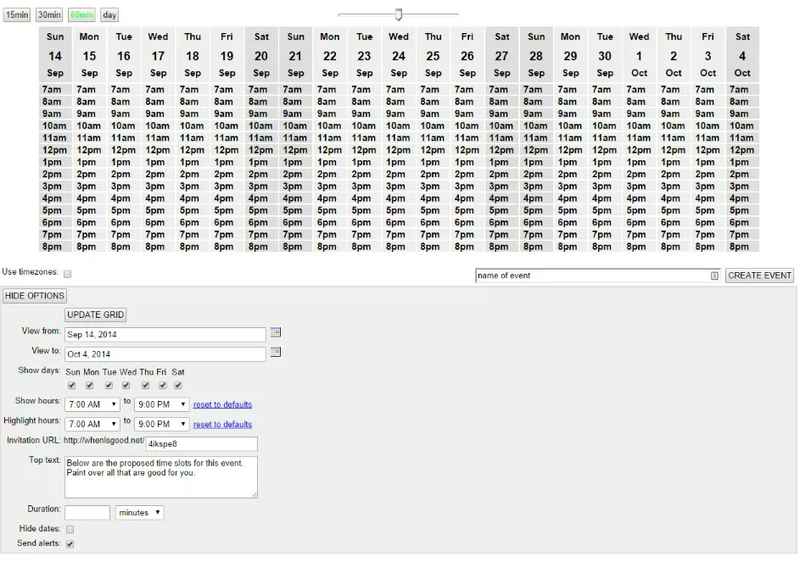 I visited a number of options like Dudle, DO’ZZ, SelectTheDate, ScheduleOnce, and so on. For various reasons I didn’t settle on any of these…but then I returned to one of the sites I’d written off for aesthetic reasons (it ain’t very pretty): WhenIsGood. After playing around with it a bit I was quite happy and have been using it since. Let me walk you through its pages and you’ll see how simple and fairly intuitive it is. First we have our dashboard (“your account”). Its very simply – essentially you see a list of events you have created and you can view, edit, or delete the events. I assume that detach allows one to remove the event from your account (you can use this service w/out creating an account). Somewhat hidden at the top right you see a link to create a new event. The enter results code is for those who create events w/out accounts – its a unique string that identifies their event and allows them to access it. I’ve blacked out a few small areas – mainly b/c they had my email address…which is floating around the internet, but I decided not to make any more available than it already is. There are a billion and one ways to get in contact w/me. Under the events I blacked out the actual links to the events, they are clickable and allow you to view the event. When Is Good New Event Screenshot. It isn’t the most intuitive interface, but if you mess around for five minutes you can figure it out. Note that you can set the length of the meeting, give the event a name like, “My Super Awesome Surprise Birthday Party For Myself.” There is that strange little slider bar above the calendar, use this to make the size of the calendar (not how many days, just its dimensions on the screen) larger or smaller. That is better. 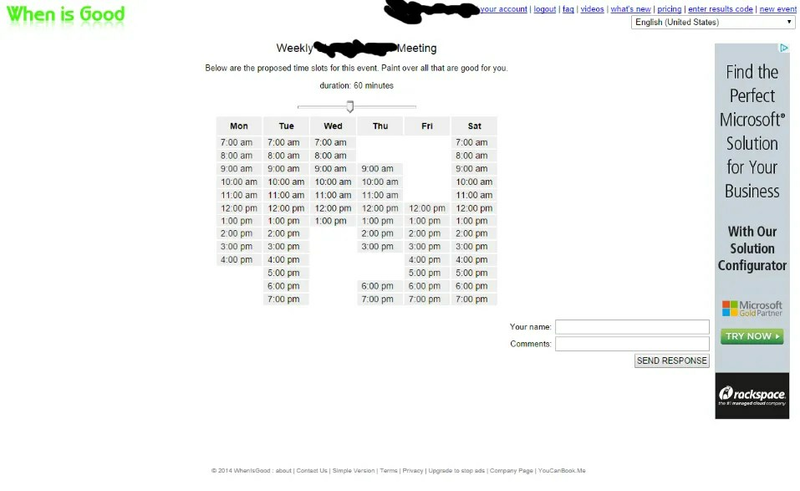 Now we can select the days we want to have displayed on our calendar. In my case I was scheduling a recurring event, which When Is Good doesn’t seem to inherently have any options for, so I just chose a week in the future and let people pick off those days, knowing that the event would then recur on a weekly basis. The individual wouldn’t see all the options I have at the top right, since in this screenshot I’m logged into my account, but at the bottom right they’d have a spot to enter their name and email and send the response. Now I see the calendar I created with info. filled out by the individuals I invited to the event. The green highlighted spaces are the slots where all respondents are available (I told you, crazy schedules). 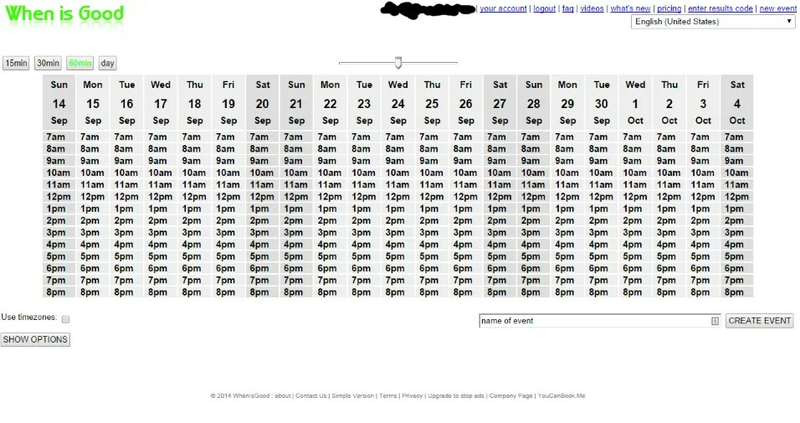 Next to each of the remaining time slots are little dots, the dots indicate how many individuals cannot attend at that day/time. 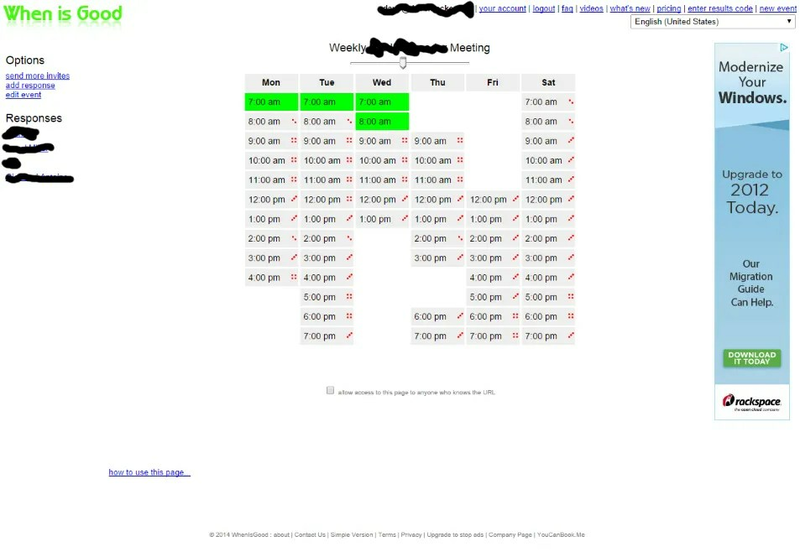 If I put my mouse over a time slot it will show me who can/can’t come and if I put my mouse over a name (under responses on the left-hand side) it will show me all the slots they selected as available highlighted in green. As you can see, it is a functional although not aesthetically pleasing tool. It isn’t entirely intuitive, but its simplicity makes it easiest enough to figure out with a few minutes stumbling around. I decided not to use Doodle b/c of the pricing essentially. If you are a business or an organization that will frequently utilize online scheduling – go with Doodle, it has more features, the pricing is reasonable, and it is more aesthetically pleasing…but if this is just an occasional thing, When Is Good will do just fine. Include dates on your What’s New page so we can tell if you have been working on the app recently. Redesign the aesthetic layout, center the main screen elements, make new event stand out from the rest of the menu options. When is Good does offer a premium version at $20/yr. which is around half of Doodle’s lowest paid plan. It adds a few more options, but nearly as many as Doodle. If I was you and willing to pay, I’d go with Doodle. Previous story Soylent: A Viable Meal Alternative?